Hey y'all! I hope you're having a great week! I have literally been stuck at home since Friday evening. I must say it's not because I have to but it's because I kind of like being "snowed in." Back in September, we had to purchase a vehicle and we were pretty responsible adults and bought an all wheel drive Kia Sorento, my mommy mobile. Well, my husband is an environmental, health, safety, and maintenance manager so he's responsible for directing snow cleanup at his facility. He's been using my vehicle to go to work the past few days and we are pretty pleased with our decision to get the AWD. We are so adult-ish, lol. But I am currently feeling that cabin fever and my kids are stir crazy. I can't wait to get out of the house and get back to normal now. But if you're going to be stuck at home (or anywhere), you've got to be comfortable. Am I right? 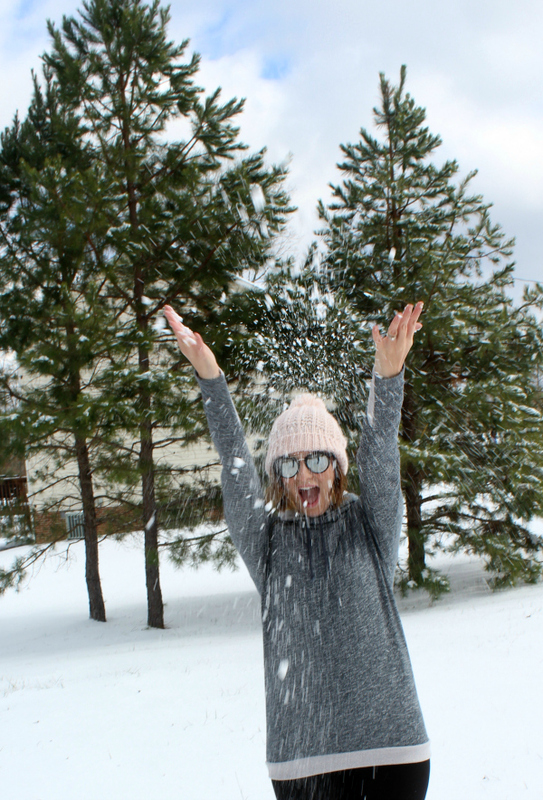 No real pants allowed on snow days, y'all. I have shared my love for Simple Addiction leggings before and I am here to tell you again, you need to try a pair. Life changing and so affordable (I'm talking less than eight bucks)! 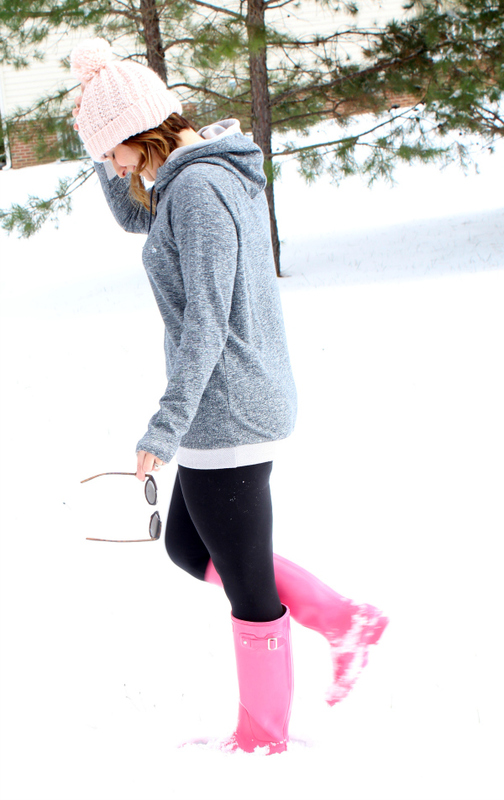 I wear these leggings literally every single day! 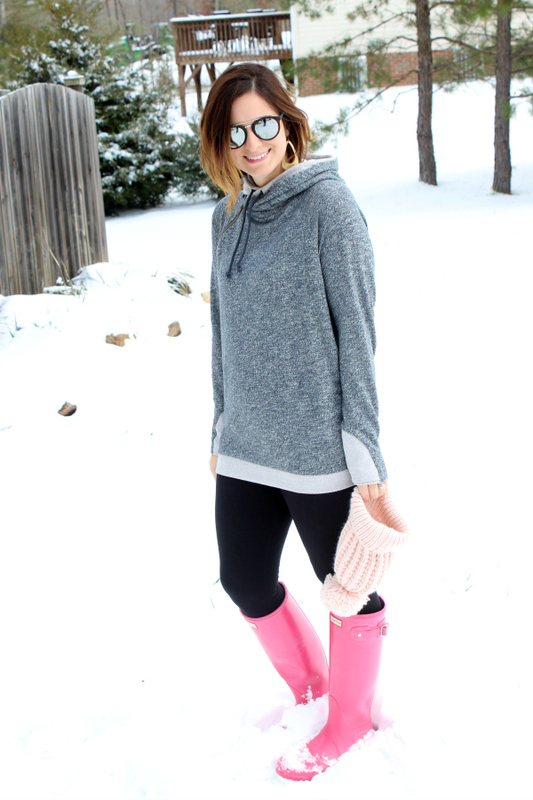 Today, I'm styling this amazing Double Hooded Charcoal Herringbone Sweatshirt that's also from Simple Addiction! 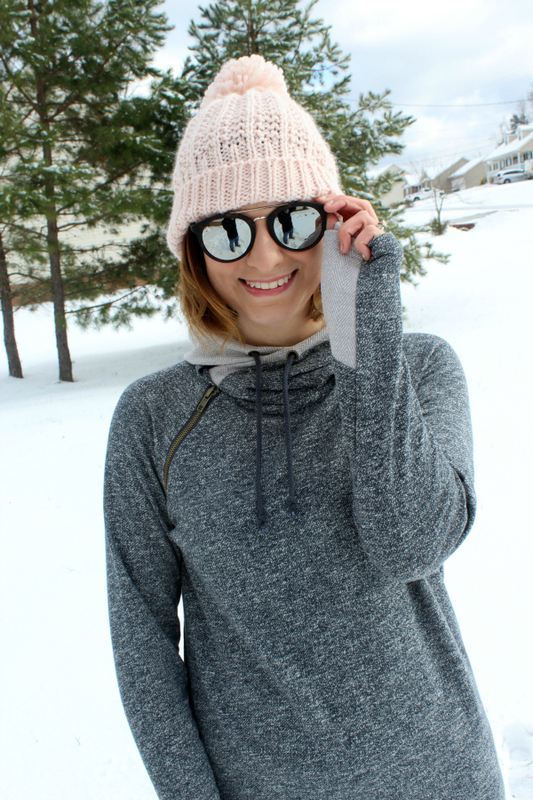 I sized up one size to a medium for a cozy, leggings friendly fit. It also comes in three other colors (love the black and white striped) and it has hidden thumb holes! 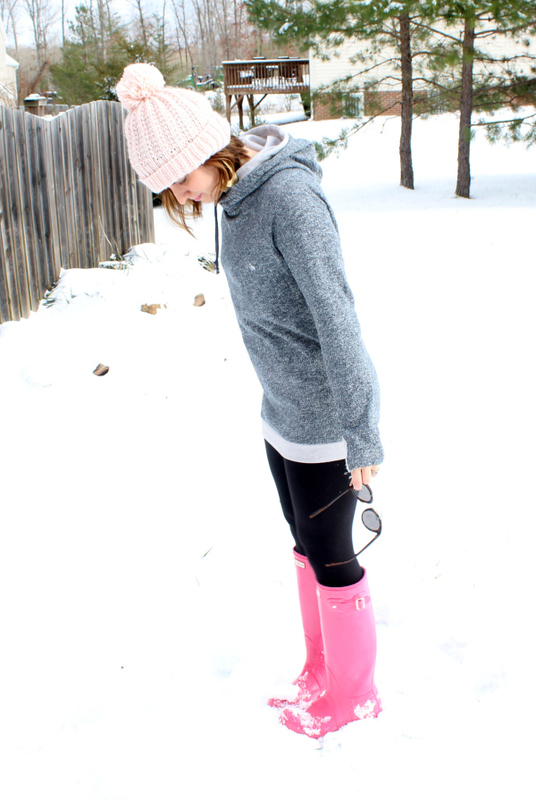 I styled my sweatshirt with Simple Addiction exclusive black leggings, gold leather earrings, pink rain boots, and a pale pink beanie. 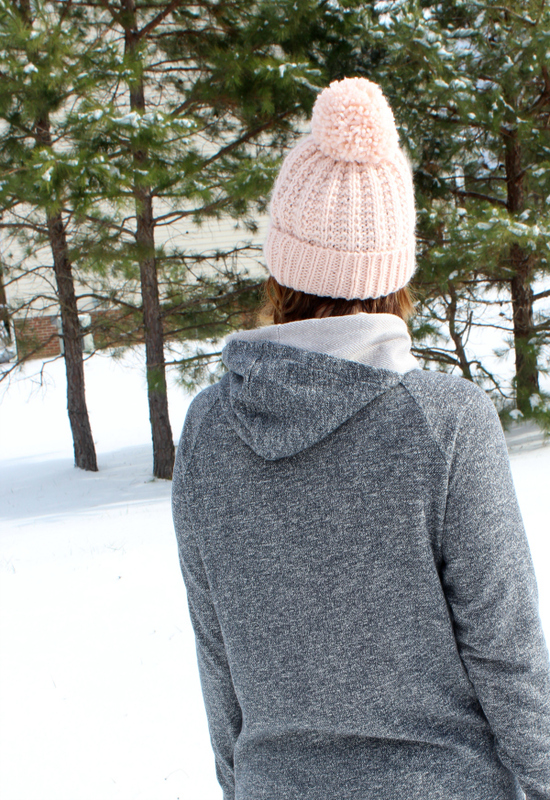 This comfy sweatshirt will be in constant rotation all winter long. You can save 15% off your order at Simple Addition with my code EMILY15! 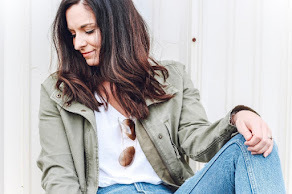 c/o Simple Addiction | Save 15% off with code EMILY15. Love the beanie! Super cute color! !